...to have a small kitchen garden, along with borders for perennials and herbs and a couple of fruit trees, within the aspect constraints. So my observation and thinking was around how I could achieve this, maximising what I can grow in a small urban garden. Something I was thinking but forgot to include in the aim was also that it should be as attractive to view, and to sit in and enjoy as possible. And, that garden had to work around the constraint of my health issues, I have ME, which could effect energy levels and limited my my ability to always be able to garden. 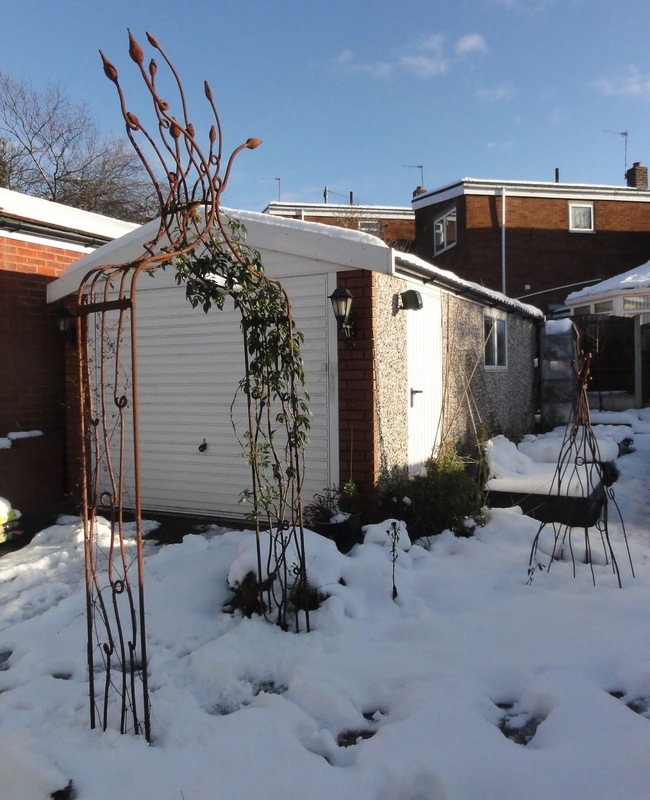 The key dimensions of the garden are: 12m long and 4m - 5.5 m wide; with the aspect East-facing, the garage wall being in effect South-facing, and the fence border on the right effectively North-facing. So, how did the garden grow in 2014? This encompasses the raised vegetable beds, some veg grown in pots, plus the Herb Border and the fruit trees: greengage, Morello cherry, damson and grape vine. It's not a large space, but since June we have been eating some veg from the garden on a weekly basis. 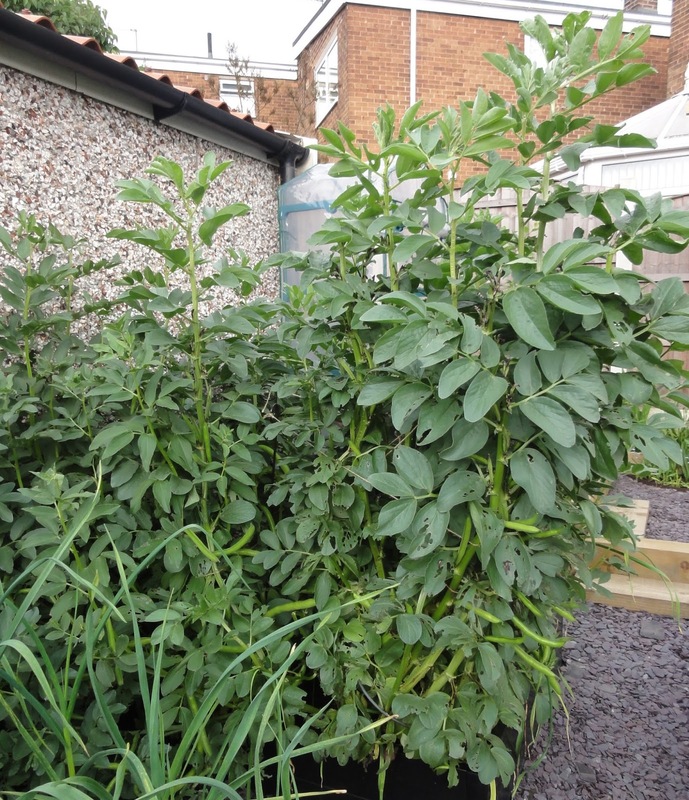 This started with an amazing Broad Bean crop 2.5kg of (shelled weight) beans from a 1m square bed. The small strawberry patch gave us several desserts, plus a few for the blackbirds (!) and I also had a fantastic crop of dwarf french beans. On and off from June to December I was harvesting everything from carrots and potatoes to kohl rabi, fennel bulbs and kale. In just the last couple of weeks I've also been harvesting the sweetest and most delicious parsnips too. It wasn't all great harvests, there were some difficulties as well. I got a reasonable crop of courgettes, though not as many as I would have liked, no gluts for me! The pumpkins/squash however, did no good at all. I did get some starting off ok, but then they got blossom end rot. I'm going to add a lot more manure/nutrients to the area they will be growing in during 2015, in the hope that this will resolve the problem. 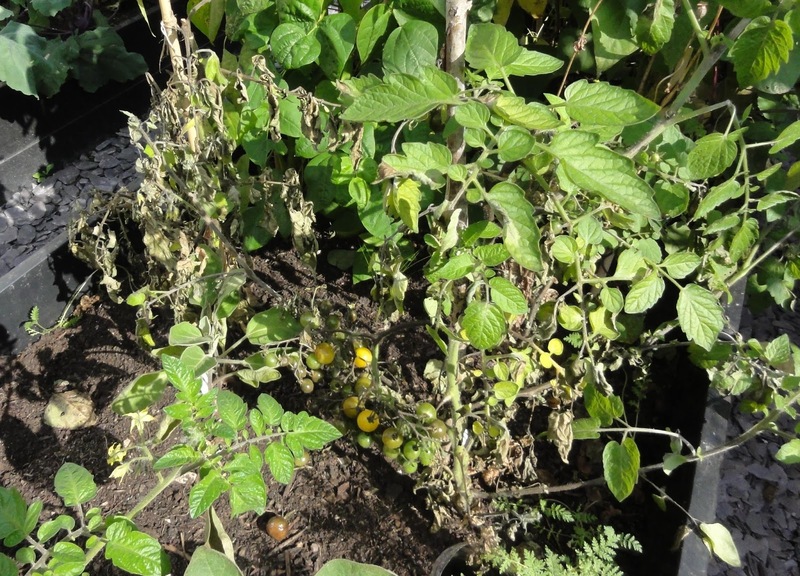 My tomatoes got hit by blight very badly and we only got to pick a few. 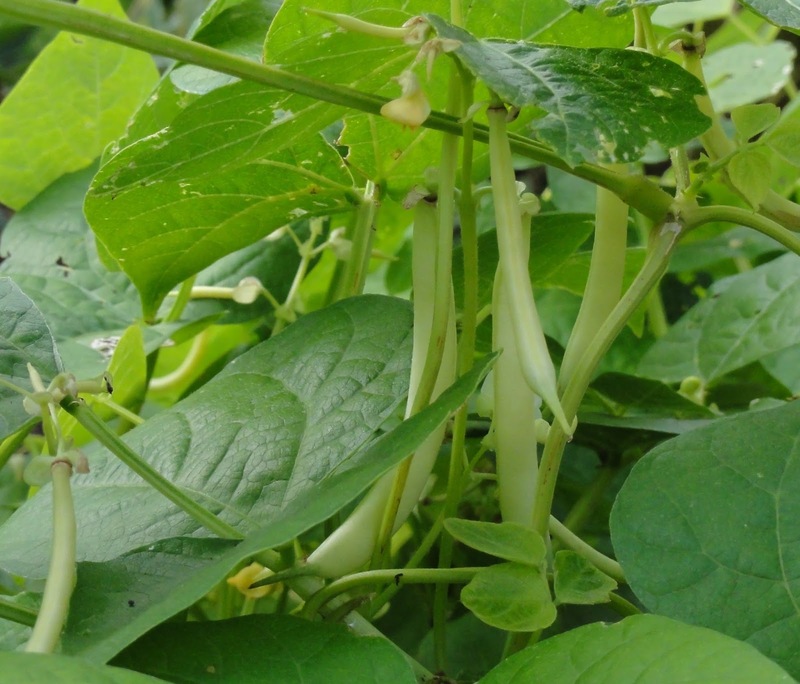 And when my climbing french beans were ready to be picked, I wasn't ready to pick them. I was going through a bad ME period and something had to give, I had to leave them and just pick the dried pods and use the beans in stews, which is what I did. So I did get to eat some of them, just not how I planned. The Herb and Strawberry borders have been very successful. In particular, I use the herbs all the time in cooking and I always have plenty on offer depending on the food I'm cooking. Next year I hope to have the time and energy to take cuttings of herbs like oregano, in order to dry them. 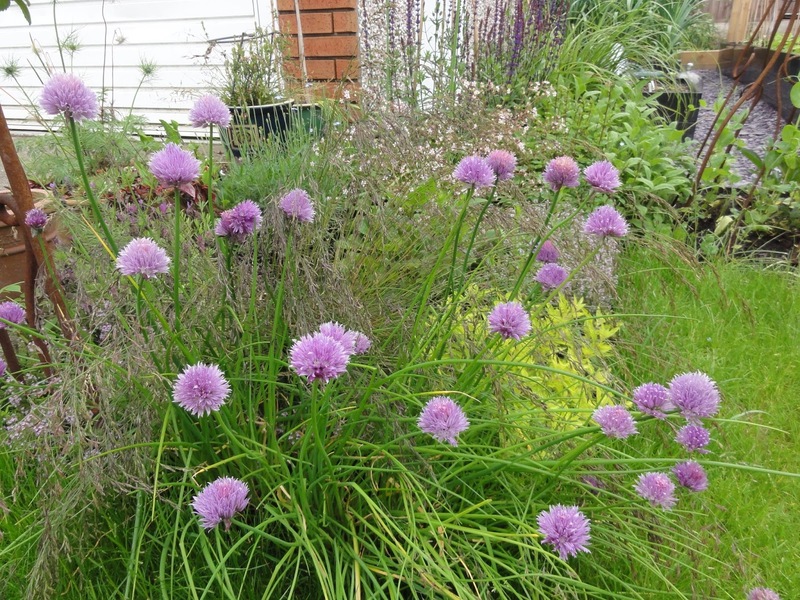 I don't eat chives, but I love them for the flowers, as do the bees. The sage has got a bit unruly and I don't use it as often as other herbs like oregano, thyme, rosemary and French tarragon, so I'm reflecting on whether to keep it in the border or put it in a pot to control it's size a bit. I have mixed feelings about the Cornus Border. It's quite young in its development and I need to be patient to let it mature. To increase lower growing/ground cover plants, I've added cyclamen cilicium and Cyclamen coum to the earlier planted Cornus-canadensis. Sedum 'Mr Goodbud' is looking good, and I assume that the Hellebores, Pulmonaria and Veronica gentianoides will fill out more next year. However, as much as I love the Cornus I've chosen per se (Cornus alba 'Elegantissima' and Cornus alba 'Kesselringii'), I'm not sure they are the right ones in this position. This is because the main feature of the Cornus is it's beautiful stems, and I chose them when seeing grass, not thinking about the black raised beds that would be behind them. So the beautiful red/dark red stems aren't all that easy to see... I quite like the colour of their leaves and think they help break up the space between the lawn and kitchen garden, but for stems, something like the orange-yellow stems of Cornus sanguinea 'Midwinter Fire' may have been a better choice. So I'll need to make a decision soon-ish, before the current plants get to established, making them harder to dig out. The other main perennial border is the Long Shady Border. This has some wonderful plants in it, for example: Amsonia tabernaemontana, Geranium pratense Midnight Reiter, Lychnis flos-cuculi (Ragged robin), Osmunda regalis 'Purpurascens', Epimedium x perralchicum 'Frohnleiten' (and several other epimediums - I've developed a 'thing' for epimediums) and the two Acers, Acer palmatum 'Bloodgood' and Acer palmatum 'Sango-kaku'. It has the Morello Cherry being trained along the fence, as well as Solanum crispum 'Glasnevin'. And it is scattered with bulbs and corms like bluebells, anemones and fritillaries. The problem is, well, I'm not sure, but it's just not right. Or maybe it is still quite young and I need to give it time to mature (again). I've realised that I haven't focused on this border enough and need to really look at it properly. So for 2015, this border will be the focus of my End of Month View. Let's see if giving it more attention, and hopefully getting feedback from readers of my blog, I might be able to pull it together. This focus may also help me what to to with the boggier part of this border, which easily gets waterlogged, as I've mentioned in the past. Despite all the observation I did over 2013, it wasn't until after the landscaping was complete and the heavy Spring 2014 rains came, that this became a problem. Some plants seem to accept being waterlogged, such as the Persicaria affinis 'Superba', Astrantia major 'Hapsden Blood' and Primula 'Guinevere'. 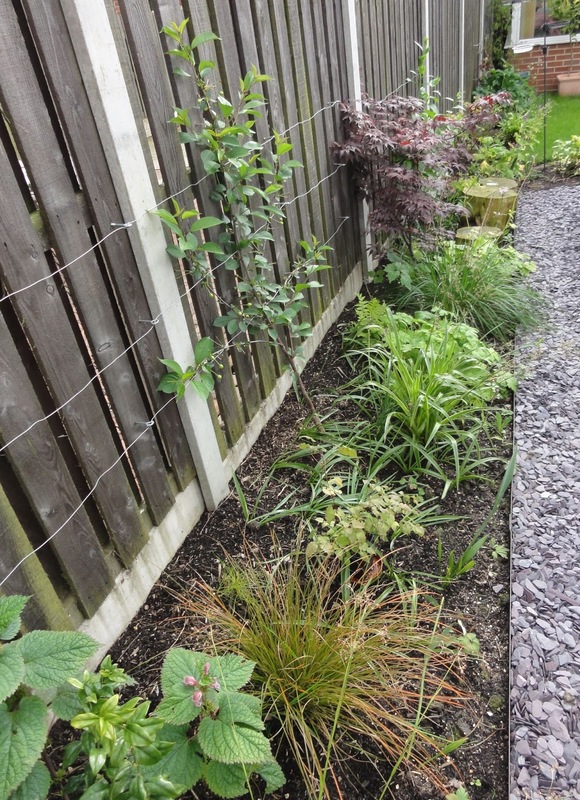 I had to move the Acer palmatum 'Sango-kaku' to another part of the border as it doesn't like water logging at all. 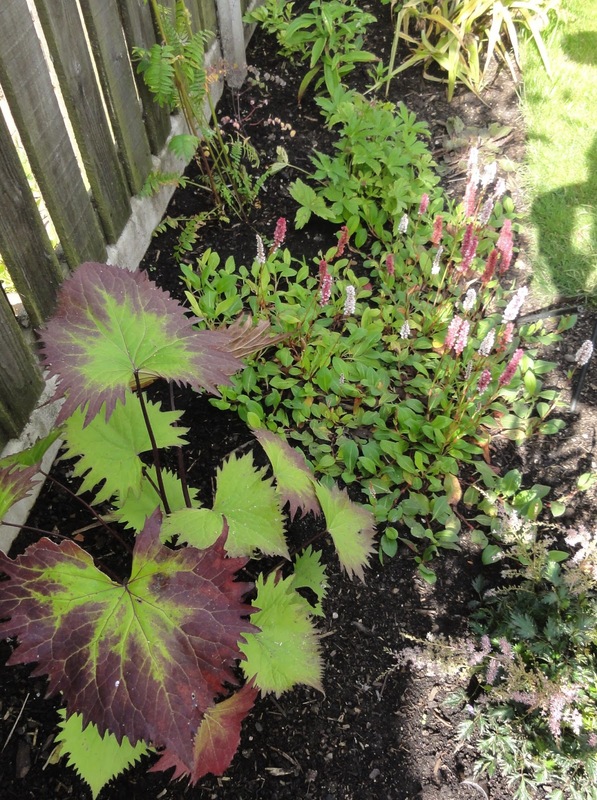 And I've added Ligularia 'The Rocket', primarily for it's foliage and the fact that it's happy in a boggier situation. You can see the large serrated purple-green leaves below. I'm just not sure if I want a 'bog garden'. So again, this will be something I'll be reflecting upon during 2015. So the main question: has the permaculture design worked? Well, mostly. Clearly their are some problems, but I have, on the whole, maximised what I grow and where, within the constraints I have, meaning both physical health and the fact it's a small urban garden. There is of course, room for development, the Long Shady Border, etc. That garage wall is a glaring omission. Well, even that, not quite. I deliberately created individual beds with paths to the wall because my plan is to eventually build some kind of bespoke 'greenhouse' on the wall, and I wanted to make sure access was built into the design. So whilst the garage wall is a large empty space, and a bit of an eyesore if I'm honest, the plan is that eventually it will be a vertical growing space in which I can get seedlings off to an early start each year, and a place for growing winter salads and other delights. I'm am aware that my garden isn't the most aesthetically pleasing. Having a functional space for growing food is really important to me. But flowers/perennials have become just as important; I sometimes feel torn in two, but am determined to have both! So I am hoping to get better incorporating flowering plants & foliage, shrubs and climbers into the garden, to add form to the function, and make it more attractive to view through every season. At the end of the day, the month, the year, despite sometimes having no energy to do anything other than look out the window, the garden has given me so much happiness this year. Whether it has been short bursts of micro-tasking, popping out to pick some flowers or harvest food, or sitting outside and reading or just looking at the plants, I really love and enjoy my garden. So that's another aim to add to the list. I think that should be number one. End of month view is hosted by Helen Johnstone, aka @patientgardener. Visit Helen's blog for her December/yearly 2014 EOMV and links to other bloggers EOMV posts. What a great first year! I think your nearly-a-year of observation beforehand has really paid off, and it's good to see that permaculture principles really do have good practical results! 1. You've mentioned things that you're going to give another year (squashes) but is there anything you're convinced is definitely out? Tomatoes? Do you think a single year is enough to ever make a "never again" decision? 2. You've already companion-planted the cornus, which gives them a bit of green to shine next to; is there any evergreen that could ramble over the end of the raised beds and give you a green background there? I can't think of any off the top of my head, but that might be an option. You'd still have the colour of the slate, I suppose. Thanks J-P - it has been good to see how the observation really helped me with the design. 1. I wouldn't use a single year to say 'never again', unless you didn't like the veg or if you felt the faff wasn't worth the time and energy invested,, because each year is different. I did give up on Sweetcorn a couple of years ago, but I haven't ruled it out entirely - I just got sick of bad/no harvests so for now putting my energies in other veg. I have had success with squash in the past (in fact my best years growing them were in our Witney garden) and I love it so much that I'm willing to keep trying. 2. I do have an evergreen geranium growing over one of the edges, the one in front of the Cornus border. But it is still young so hasn't taken off properly yet - I'm hoping it will next year. You are right that there are other plants I've planted with the cornus, and if they take off next year, maybe that will give enough contrast that I don't need to move/change them. Mmmm, thanks for that idea! I was really surprised to hear you describe your garden as not very aesthetically pleasing. I really don't agree, you have strong structure and some beautiful plants and plant groupings. I don't think any of us (other than the pros) ever get a planting area "right" first time, and with shrubs it always takes a while to see how the area will actually pan out as things mature. But I think you achieved marvellous things, creating a space that looks good, provides you with food and colour, and all in the context of battling ME. Frankly I think you should give yourself an enormous pat on the back and look forward to the tweaking and primping that will mark phase 2. I'd agree wholeheartedly with Janet's comments. It is very difficult, if not impossible, to get it right first time especially if you are getting to know a new garden and its conditions. Plants can always be moved, in my case more than once, and that is part of the pleasure of developing the garden. Pot calling kettle black I know, but leaving the garden to mature for a little while might tell you all you need to know! I think we are our own worst critics, we compare the garden to what we can see in our heads, others just see beautiful flowers, fruit and veg! You have done amazingly well, considering you are fighting ME at the same time. It's not easy having a muscle problem, as I know, you have worked wonders doing a little and often. At least your snow will give you a well earned rest, time to sit and make plans! Happy New Year. Given what everyone else is saying, I'm sorry I left the "isn't the most aesthetically pleasing" comment uncontested now! I would only say that even back in November I commented that that the view from your study window showed it all really tying together. I'm only sorry I wasn't as effusive back then, as it really is remarkable. and even that needs comparing to what you could see in November and now. Really, it's a fantastic improvement, and I bet that even the best gardeners don't turn around such uninspiring spaces in one iteration. And besides, if you'd got it perfect first time, what would we have to look forward to in 2015? Jessica/Pauline/J-P: you are all quite right. I am my own worst critic and you all, including Janet, have made me realise that I shouldn't be comparing myself to others, though that can be hard as there are so many beautiful gardens out there! My garden is new, and ironically, I do feel like the structure is there. But I do need to give it time, to edit, tweek and to mature. And at the end of the day, as long as it makes me happy, which it does, that should be the most important thing. I almost want to go back and delete the 'aesthetically pleasing' comment. But it will stay, as a reminder in case of future lapses! I like the video you made. You've done so much in your garden over the past year - it all looked brilliant. Can't wait to see what you do over the coming year. I think I will just add a few words to what’s already said here; we gardeners tend to be very critical of our own garden (especially women? ), and what we probably should have in mind is that when we see photos of other gardens, we see them from the best angle, at their best, only showing the best bits etc. At least you do in my garden! I carefully position my camera so no orange and pink shows up in the same photo, even though they happily grow next to each other in my tiny garden. And I pick up dead leaves and throw them behind me before taking photos so it looks like my garden is pristine. I look forward to seeing your garden evolve, Happy New Year and all the best for 2015! 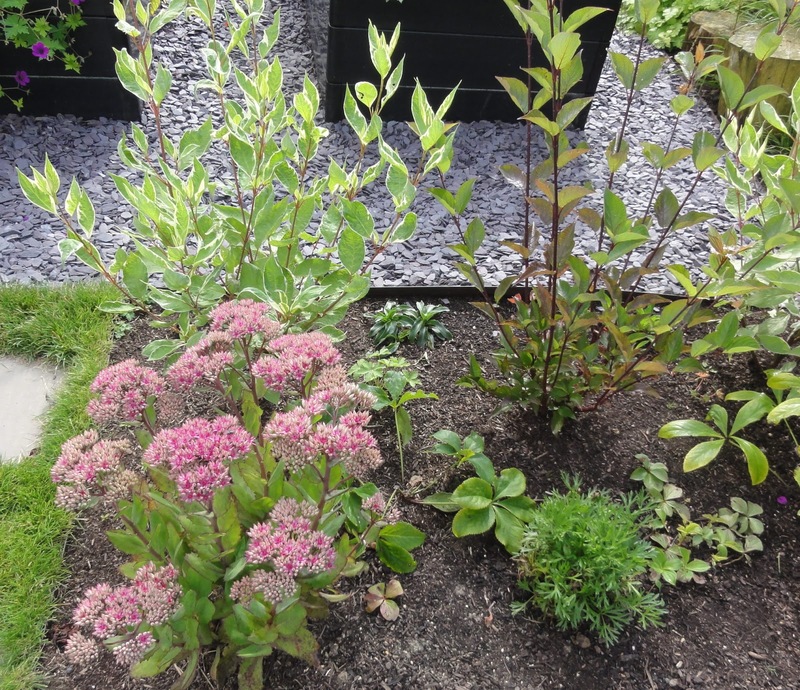 Julieanne I have enjoyed seeing your garden over the past 12 months and how it has come on. We are in a similar postion re red stemmed Cornus too. I love that despite your condition you can do something you love. We can clearly see just how much you love your garden. There's lots said above that I would echo. All the very best for 2015 both for you, your family and your garden. BTW, I nominated you for a Liebster award, please see my latest post for info. thanks.